The theme for this month's Paper Smooches challenge is Christmas in July. I took some cues from the sweet inspiration photo when creating this holiday inspired design. I used PS's Coffee Cozy die to create a die cut coffee cup from kraft and white cardstock. The red snowflake on the kraft sleeve was die cut with a die from the Mitten die set. I used foamt ape to adhere the to go cup to a kraft cardfront with a red striped paper panel along the bottom. A piece of red grosgrain ribbon set the striped panel off from the rest of the card. I accented the card with a pair of candy canes from the Giddy Gumdrops stamp set and a bit of "steam," courtesy of a piece of a taupe pearl flourish. 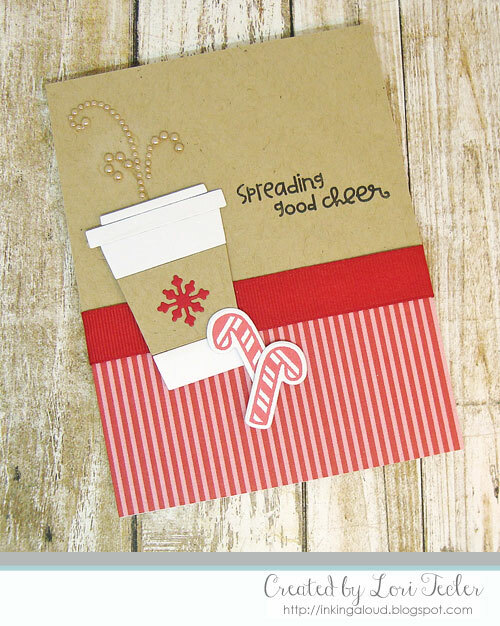 The "spreading good cheer" sentiment, also from the Giddy Gumdrops set, was stamped to the right of the to go cup in black ink to finish the design.